I am sure most people have played “Follow the Leader.” It is a simple game, but it can become quite complicated if the leader heads in a direction the rest of the players do not want to go. Would you follow the leader if he walked along the edge of a steep cliff? Would you follow into the path of oncoming traffic? Seeing such a path filled with extreme challenges is a stumbling block, especially if following the leader means giving up all you have and heading to Jerusalem to offer your life for the sake of others. But that is exactly what Jesus did and he calls people to follow him along this same path. 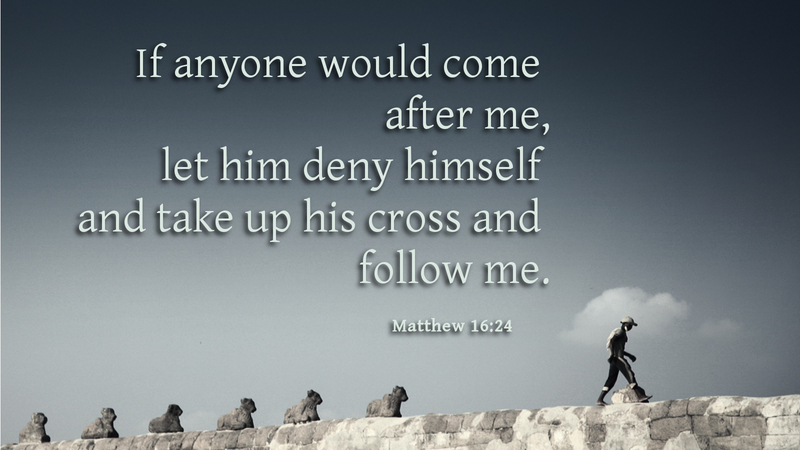 Jesus says, “If anyone would come after me, let him deny himself and take up his cross and follow me.” Our Lord calls his people to be living sacrifices, unselfishly denying ourselves, placing the needs of others ahead of our own. Only when we do this can we truly say we are following our leader. There are many false leaders in this world. They make empty promises not intended to be kept. They cannot forgive sins, heal our infirmities, or grant us everlasting life. Only through Christ, our leader, can people enter the gates of heaven. Prayer: Holy God, help us to follow your Son as he leads us along the path of righteousness. Amen. This entry was posted in Discipleship and tagged Disciple, Discipleship, Follow the leader, Following Jesus, Jesus Christ, Spirituality, Take up your cross. Bookmark the permalink.